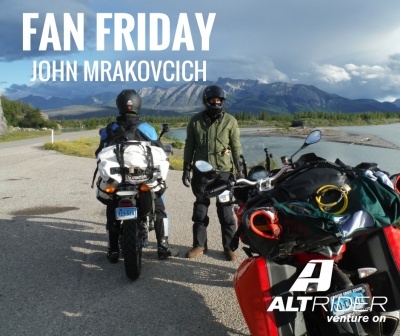 Another Friday means another epic weekend of riding is almost upon us, as well as another featured AltRider fan! This week we talked with John Mrakovcich, 53, from Connecticut. John’s been riding for forty years, since he first started taking his dad’s bike around the block at the age of 13. John and his wife ride for two reasons: “We either just ride around locally to get groceries or we take off on multi thousand mile trips, mainly in Canada. Nothing in between.” They’re often joined on their rides by their son, Dom, who has ‘adventurized’ his own Yamaha WR250R. John’s first AltRider product was our Side Stand Foot for his KTM. “It turned out to be one of those pieces you don’t really notice but is supremely useful. Those small things make a huge difference.” For his last big trip he also purchased AltRider’s 38L SYNCH Dry Bags to carry gear through the airport as well as on the ride. “I believe the AltRider products are innovative and practical without compromising on aesthetics,” said John. 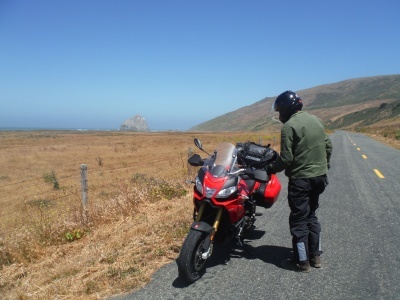 “On the next trip I would love to try AltRider’s Hemisphere Soft Panniers for the WR and the 990!" John’s done a lot of riding in Canada, including Newfoundland, with his AltRider gear. His dream is to ride South – way, way South – and tackle the infamous region of Patagonia with his family. We can’t wait to see the pictures of them when they get there!